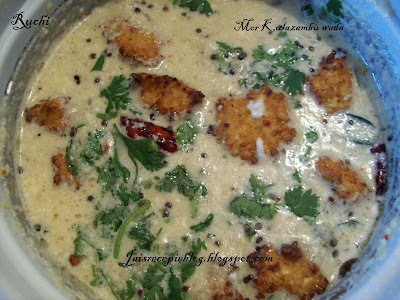 Morkuzhambu with Urad-Vada or Ama vada is awesome mouthwatering dish. This curry is prepared using savoury buttermilk or curd. You don't have any vegetables and want to make something yummy for yourself or your guests prepare vada morkuzhambu. Vada can be substituted by any veggies. The soft spongy urad dal /ama vadas soaked in tangy spicy mor kuzhambu This is one of the tastiest Morkuzhambu and is also ready in a moment. A traditional dish,more kuzhambu is specially made during festivals. every SouthIndian family will have their own style of preparation... A not too sour curd makes good mor kozhambu.. I used to prepare in both vadas. But today I prepare it with amawada.This dish can be served with rice. And here comes the tasty recipe! (Note- You may use rice flour instead of rice)coriander and curry leaves. 1.In a large vessel whisk the curds until its creamy and smooth. Add 3 cups of water and mix well till there is not lumps. After you soak the above, grind to a smooth consistency. 2.For making the Morkuzhambu,Add the turmeric, salt and ground paste and mix well and let it all come to a smooth boil on a low flame. 3.you have to keep stirring so the yogurt does not separate and this mixure should just get warm, not Boiling Hot. Start adding spoon fulls (you can as well make patties out of the dough and fry in the oil. If you find it difficult drop in spoon fulls) of the dough (do not crowd) and fry them until golden. Let it become golden brown and turn both sides equally and take out Drain in a kitchen towel and add it to the boling Mor kuzhambu and garnish with the coriander and curry leaves. Mor kuzhambu with vadai? that's a new one for me...and sure sounds yummy! This is new to me, adding ama vada in mor kuzhambu..Will surely try this sometime.. I love this morekozhambu vadai. In my mom's place, they don't do it. but in my inlaws place, they put both ulundhu vadai and paruppu vadai in more kozhambu. I kinda like this taste. also your smoothie was really refreshing. I tried adding comment, but it didn't let me I dont know why... I am taking print out of your chocolate cake and gonna try this today along with my girls. They want to mix the flour.. I love this mor kuzhambu with vadai than vegetables with mor kuzhambu..delicious!!! this one looks sooo yummy jaishee. never tried putting vadas in mor kuzhhambu.. it tastes like dhai vada right? Thanks sriharivatsan Try this kuzhambu and let me know.. Thank u mahi It taste diffrent from dahi vada..
Something new to me. Looks yummy..
You have something waiting for in my blog. Plz check..
Jaishree it sounds new to me with vadai, but looks so inviting,more kolumbu and vadai is my fav , so good treat for my taste buds. Got to make these... they sound much more exotic than their counterparts, the good old curd vadais. looks so yummy! More kozhambu paakarthukku russiya irukuthu. Thats indeed a great combo of vadai in morekuzhambu! I usually add ulundu vadai,should try this too!